New York, NY – April 7, 2016 – Posterscope USA, a leading Out-of-Home communications specialist, together with Lamar Advertising Company (Nasdaq: LAMR) has unveiled a new outdoor campaign for the 2016 Chevrolet Malibu launch using vehicle recognition technology that can identify certain types of vehicles and generate dynamic, customized messages to drivers of those vehicles on digital billboards. Developed in conjunction with Carat and Commonwealth, the campaign is now live in Chicago, Dallas and the New Jersey area and is designed to raise awareness of the Malibu’s distinguishing features, including safety and fuel efficiency. The vehicle recognition technology is embedded within a pole-mounted camera alongside the highway. As a vehicle approaches, the camera hones in on the grille and is able to identify the make and model of the vehicle. If it is a competitor to the Malibu, the driver of that car sees a customized message generated just for them on a digital billboard about 1,000 feet down the road. The camera does not collect license plate information or driver imagery, and all data is deleted as soon as the customized message is delivered on the billboard. 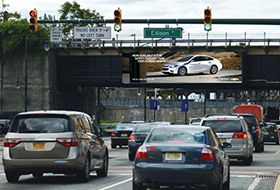 The vehicle recognition campaign, currently running in the three markets through the end of April, is part of a larger out-of-home initiative spearheaded by Posterscope USA to raise awareness and drives sales of the new 2016 Chevrolet Malibu. Posterscope is a full service out of home communications specialist with 700 people in 48 offices across 27 countries. US offices include New York, Los Angeles and Detroit. Posterscope is at the vanguard of cutting edge developments in OOH such as digital, programmatic, and OOH interactivity. Clients include: General Motors, Mastercard, Disney, The Home Depot, Red Bull, Adidas among others. Founded in 1902, Lamar Advertising Company (Nasdaq: LAMR) is one of the largest outdoor advertising companies in North America, with more than 325,000 displays across the United States, Canada and Puerto Rico. Lamar offers advertisers a variety of billboard, interstate logo and transit advertising formats, helping both local businesses and national brands reach broad audiences every day. In addition to its more traditional out-of-home inventory, Lamar is proud to offer its customers the largest network of digital billboards in the United States with over 2,400 displays. Please contact us at pr@lamar.com or visit our website www.lamar.com for additional information. There is a billboard along a highway west of Chicago that is just as smart as any online ad, if not smarter. Motorists behind the wheels of a Toyota Camry, Nissan Altima, Hyundai Sonata or Ford Fusion might even get the feeling that they are being watched. They'd be right. Lamar Advertising and RAREFORM have partnered with renowned artist Tyler Ramsey to launch the second installment of Art Lives. 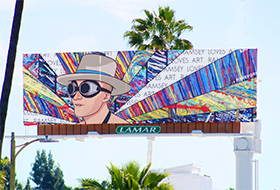 Lamar is displaying Ramsey’s original artwork on one of its iconic billboard locations on Sunset Boulevard in Los Angeles. The billboard campaign will run through the end of April, and then RAREFORM will give the artwork a second life as repurposed bags and accessories.